A Whisper In The Noise + No Clear Mind/LIVE Thursday May 10 @ SIX D.O.G.S. The self-described “orchestral garage rock” band, A WHISPER IN THE NOISE gives an extremely humble and personal touch to gorgeous, string-laden music. 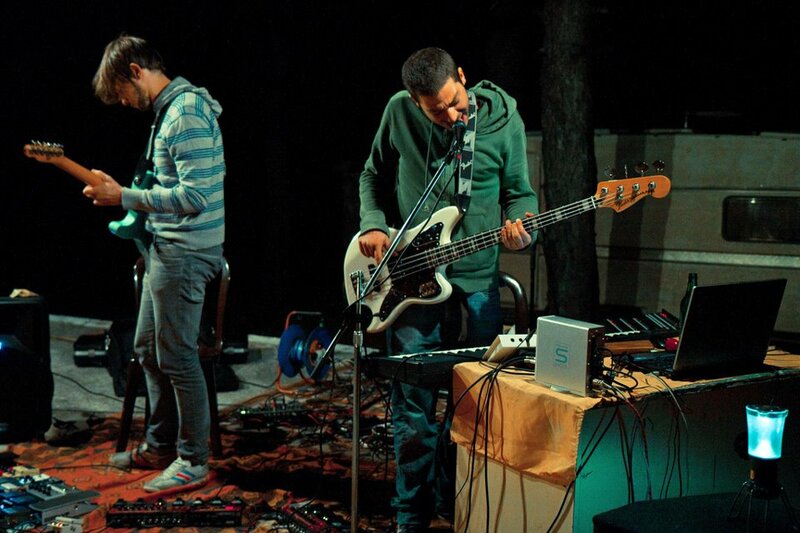 Their instrumentation includes cello, violin, French horn, synth/electronic keyboards, bass and percussion in some variation, resulting minimalist expression, unique arrangement of instruments, and the inclusion of visual media elements for live performances. Since their inception 10 years ago, their three critically acclaimed albums , “Through The Ides Of March” (2003), “As The Bluebird Sings” (2006) and “Dry Land” (2008) showcased the band’s remarkable growth and ability to challenge themselves to greater heights with each new phase. AWITN began their musical career sounding like a combination of Nine Inch Nails and “Kid A” era Radiohead, but by the time 2006 rolled around, they had more in common with a male fronted version of The Dresden Dolls, merging a gothic saloon flavor with a dark cabaret aesthetic, culminating all in the 2007 release “Dry Land”, produced by long-time friend Steve Albini. 2012 will see AWITN as new incarnation, consisting only of two members -West Thordson(drums, percussion, keyboards, electronic, piano) and Sonja Larson (violin, strings). Together they create new, riveting mix of sounds that consists of different layers of synthesizer and samplers. This year’s album “To Forget” (released by Exile On Mainstream Records) finds AWITN engaged in an unconditional playfulness with a melancholic natural environment which brings memories of another era. Post Rock/ Dream Pop NO CLEAR MIND move inside the same musical labyrinth. They collect musical images from bothAthensandCreteand evolve through a space-time improvisational journey that begun six years ago and culminated with the completion of their debut album “Dream Is Destiny”. Their musical coherence is casting a spell on numerous blogs around the world and is documented by hundreds of thousand hits on YouTube. Their album is available for free downloading on the Internet and has surpassed the number of 8.000 downloads so far. NO CLEAR MIND with path the way for A WHISPER IN THE NOISE and together they will give us an evening of dreamy sound and image.